All agents' availability status is set to Invisible (see Setting your availability status). If the trigger should fire only once per individual, select the Each visitor will receive this message only once check box. 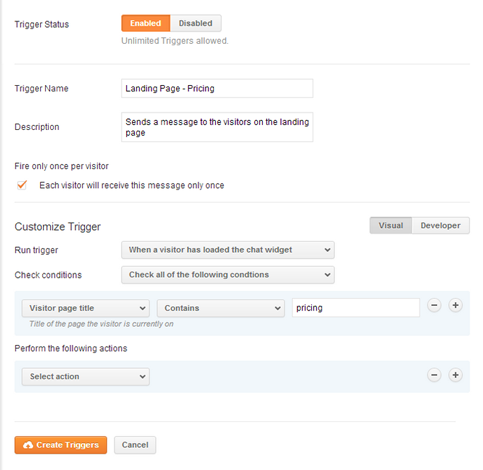 In the Customize Trigger section, use the Run trigger drop-down to select the event that should fire the trigger. In our example, we want to check the page URL whenever a visitor loads a page on your site, therefore select the first option. Under Check conditions, click + to add a condition. Select actions under Perform the following actions. To add placeholders, type @. Referencing point 8: Select actions under Perform the following actions. To add placeholders, type @. Where can I find a full list of placeholders? When I type "@". Options are not appearing.